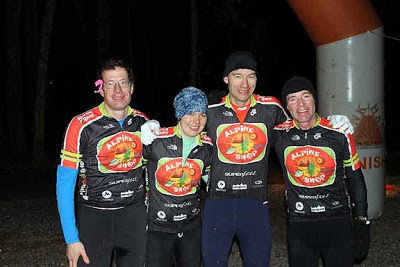 As I mentioned earlier, I am substitute racing on Alpine Shop's adventure racing team this season because Carrie hurt her knee in a mountain bike crash and needed surgery to fix it. While she recovers, I'll be racing with Jeff, David, and Doug. Here is the first installment of the season, the Bonk Hard LBL Challenge 18hr Adventure Race. We all arrive at Kentucky Dam Village, site of the pre-race activities (check-in, dinner, meeting, cabins) and are given really nice Columbia fleece vests as part of our race entry. Thanks, Bonk Hard! Jeff's reserved an "Executive Cottage" which is probably the nicest pre-race accommodations I've stayed in - tons of room for all of our gear and bikes, a kitchen, and a great table for map prep. We do some bike fiddling and then go to eat dinner where Carrie is bombarded by questions about her knee. She has been a fixture on the AR circuit for so many years, and racers want to know what the story is. We all finally manage to feed ourselves (2 servings of the bread pudding for me, thanks!) and go across the street to the pre-race meeting. Gary starts the pre-race meeting and the course is quickly revealed to be one of the most interesting ARs I have ever participated in: 45 checkpoints, all rogaine-style (meaning you can visit in any order), and only 3 are mandated as paddling. We can get the other 42 CPs via foot or bike or more paddling. This is truly a choose-your-own adventure and allows every team to play to their strengths...are we better bikers? Runners? Paddlers? Navigators? Game on. Planning in the Executive Cottage. As it happens, Alpine Shop is pretty dang good at each AR discipline, but I'd say the biggest strength we have is experience. Or rather, the biggest strength the boys have is experience, since I am a newcomer to the team. We return to the Executive Cottage and plot all 45 CPs efficiently. Then, we start looking at route options. 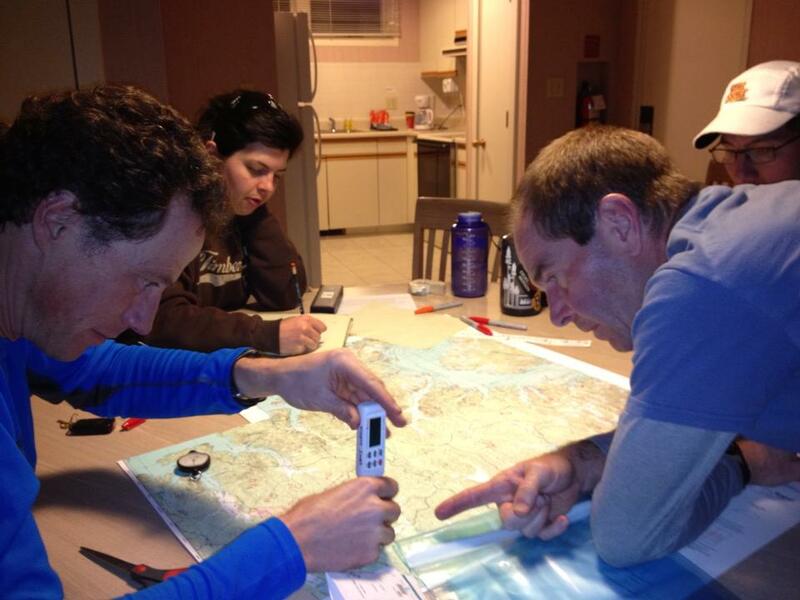 I trust David and Jeff's wisdom and we start piecing together a sweep route. It comes together gradually and in chunks but pretty soon we have a good idea about how best to complete the course. But, once we put some time estimates to it, we realize that sweeping the course (getting every CP) will be tough. So we revisit our route, giving ourselves some time cutoffs and identifying good CPs to jettison (word of the evening, along with mint gum) if things are going poorly. We finally wrap up map and gear prep about 1:30am, which barely gives us any time to sleep before the 3:30am wake up call for the 4:00am departure, the 4:15am bike drop, and the 5:00am start. Doug, David, me, Jeff just minutes before the start. Sorry about the headlamp glare and Jeff's weird grin. We arrive at Race HQ (Hillman Ferry Campground) with about 30 minutes before the start. We huddle in the warm van and debate glove choices. I try the Executive Cottage coffee in my mug and it's really, really bad. But thankfully Bonk Hard Racing has provided hot coffee at the HQ so I fill up on that. It's a delicious luxury and very much appreciated at a winter race. We say hi to our AR friends/competitors and are treated to an AMAZING performance of the National Anthem by one of the racers. We started at Hillman Ferry Campground. On the way to CP23 (aka the bike drop aka North Welcome Station) we picked up CP6 and CP5. Did I mention, we are doing this in our bike shoes? It's such a short trek, and we are going almost directly to the bike drop at CP23. When we first planned this I was not amused. But, as I thought about it, it made lots of sense because our feet would already be in warm gear once we hit the bikes, and we could get out onto potentially bottlenecked singletrack with more speed. So, Gary counts us down and we clomp off into the pre-dawn woods. We have a little nav bobble on the way to 6 but David corrects it quickly and we run into the bike drop in good spirits. My bike shoes weren't nearly as uncomfortable as I thought and now my feet are toasty as we quickly transition. Picked up bikes at CP23. CW loop of the Canal Loop trail, punching CP4, CP3, CP2, CP1. Then onto the paved Trace Trail to CP11 (off the map). Our first order of business is to crush some of the sweet singletrack LBL is known for. It reminds me a lot of Council Bluff Lake, except without as many rocks. I'm on the new SegSlayer and it is one amazing machine. David leads out the team and sets a perfect pace - it has me hustling to keep up but doesn't trash my legs. The sun rises while we are still on the Canal Loop and it is beautiful. I'm so thrilled to be outside, racing on awesome trails with an awesome team on an awesome bike. Life is good. Except when David gets a flat on the singletrack. But we execute a lightning-fast change (seriously...less than 5 minutes...I timed it) and are back on the trail with minimal interruption. The rest of the singletrack is wonderful and soon we hop onto the paved North/South trail, where we are able to tow and GO FAST. We have a little trouble with CP11 which requires a short out-n-back run in the woods off of a fire road, but again David corrects us and we are able to keep pushing. We see Rachel and Dylan from Bushwhacker just after we punch 11 and that motivates us to hustle to CP A, a manned transition area where we have a gear check and the canoe put-in. Despite the general disdain that most adventure racers feel about bikes in boats, we decided the night before that the most efficient route requires us to bring the bikes with us on the 12.5mi paddle. 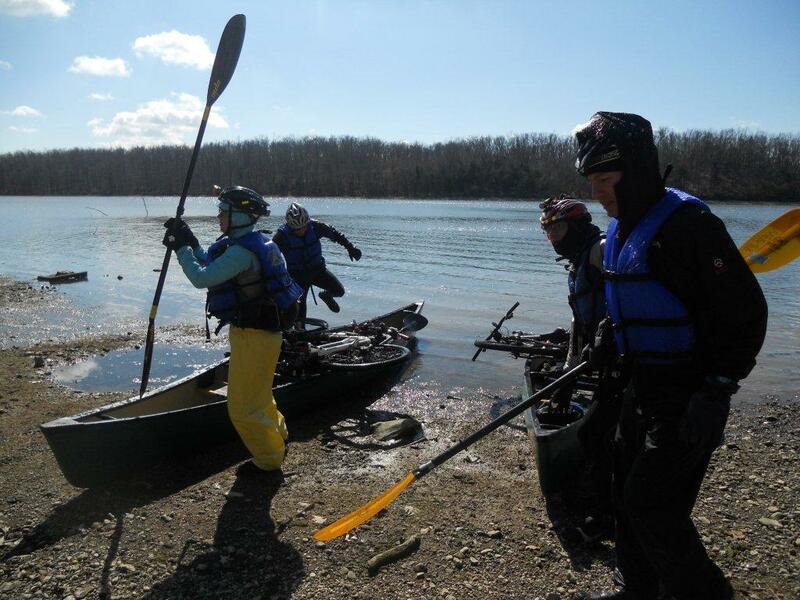 So after we pass our gear check, we break the bikes down to the shore, lash them to the canoe, and shove off into the chilly waters of Lake Barkley. I'm in the boat with Jeff, paddling with my Christmas/birthday present, a new Epic 4-piece carbon paddle inspired by the one I borrowed from Brian of Epic Machinery for the 2012 MNOC Adventure-O. This paddle gives me great feedback from the water and makes me look like I actually know what I'm doing (hint: I'm not a very good paddler...yet). So we start paddling our way to CP 10 and before I know it, the wind has picked up and I start to get cold. 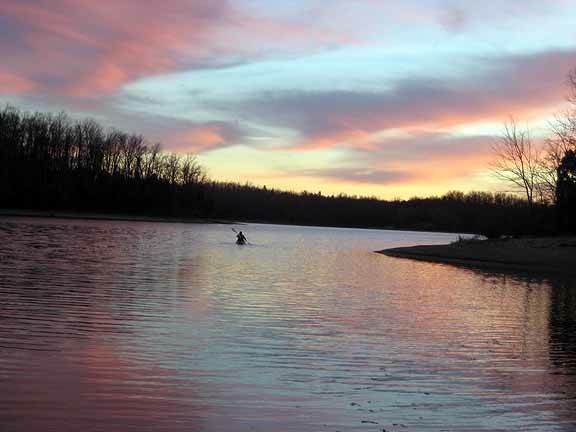 No worries, I tell myself, just paddle harder. It doesn't help that I'm getting wet from paddle splashback, and it's barely 25F. Then on the way to CP26 I start to realize I might be in trouble. Jeff seems to sense this and starts asking how I'm feeling. Um, pretty cold, but I think I just need to eat something, can you hand be a probar from my bike's bento box? He does, and I chow down while David and Doug complete a mini-portage, punch CP26, and return to the lake. We are faced with a really strong headwind on the way to CP8. The chop on the lake picks up and there's nowhere to hide from the gusts. Jeff does an incredible job guiding the boat through the waves, but the situation is such that I forget about the race and just focus on not dumping the boat. At least it helps take my mind off being cold. And I am REALLY COLD - the worst I've felt in recent memory. There are Coast Guard safety boats on the water and we speculate if they will call off the paddle due to dangerous conditions. I am in enough discomfort that I hope they do. But, no announcements are made as we pass them (very slowly), so we just keep paddling. 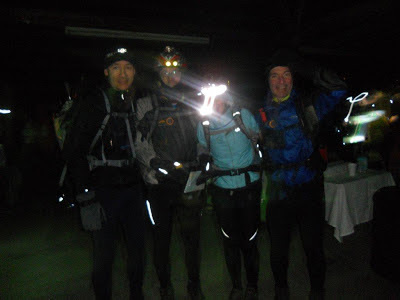 We make a plan to full stop at CP25 and put more clothes on me and Doug while Jeff and David punch 25 and nearby CP24. Doug's wheel and David's fork at the take-out. Cold. We beach kind of in the middle between CP25 and CP24 (they are on 2 separate but close islands) and when Jeff gets out of our boat to punch, he can hardly walk from his legs being so cold. But he soon shakes it off, goes and gets the punch and comes back with my rain pants which were in Doug's pack. I put them on along with my fleece and shuffle around the beach to try and get my heart rate up. Doug does the same and I imagine we look like waddling penguins to the other approaching teams. 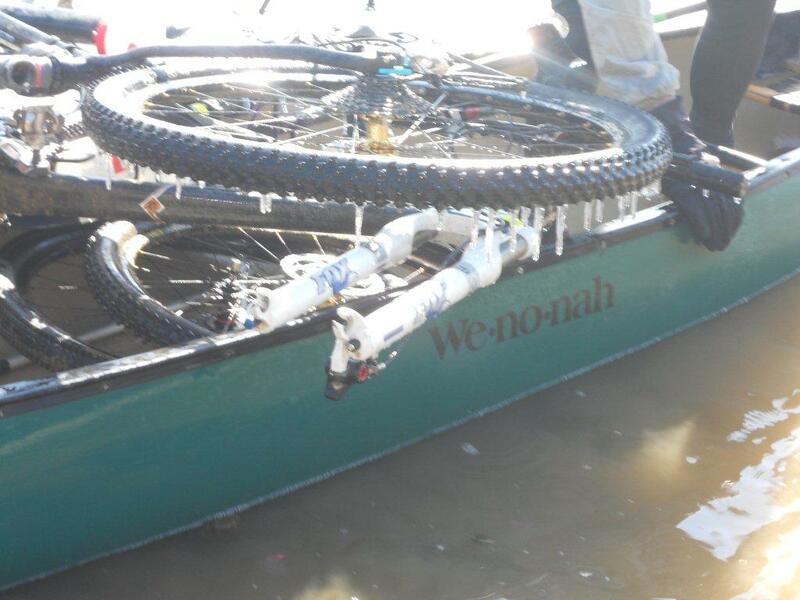 No one ever said adventure racing was dignifying. Alpine Shop at the take-out, wearing just about every piece of clothing we brought. Back in the boats, the horrific headwind has turned into a terrific tailwind, and we are able to make up some time on our self-imposed schedule. I am warming up significantly and as we pass the Coast Guard safety boat, this time I hope they will let us keep paddling despite the bad conditions. They do. We get the rest of our CPs with minimal fuss (I even punch a few, which entails more waddling). But, as we are approaching the last two CPs, we know we are behind schedule so decide to drop CP27, a longish out-n-back paddle into the wind. It is a tough decision to make this early in the race, but we are committed to our plan. As we approach the take-out at CP B, we see Carrie's van there since she is volunteering. It's nice to see a friendly face after such a painful paddle. We assemble the bikes, break down paddles, and are thankful for the steep hill out of transition that helps us start the long warming-up process. Me back at the take-out, feeling like an Easter egg. We only have a short distance to ride before we find a spot in the woods to stash the bikes before we set out on our first significant trek. We've dubbed this the "north o-loop" and transition as quickly as possible with frozen extremities. The first few CPs on this loop are completed on frozen feet. Since 5:00am, we have been racing in bike shoes which, at least for me, have been soaking wet since 7:45am. Now that I have my dry trekking shoes on, my feet finally have a chance to thaw. My body is warming up too; at each of the first few CPs I'm removing various items of clothing until I'm down to my base layers and the new 2013 Alpine Shop jersey (still can't believe I get to guest race on this team!). I don't really remember much about this section except David nailing the navigation and the team moving very efficiently through the woods. We're not sprinting, but we're not stopping either unless it's at a CP. Constant forward progress helps us make up time on our schedule and we are back at the bikes with a smaller deficit than when we started. We return to our bikes that we stashed a few hours earlier and find that our spot has turned into a mini TA. Several other teams have left their bikes next to ours and it's sort of humorous to see them all in this random spot in the woods. But there's no time for laughing, AR is serious (ha!) business and we transition back into biking gear and back onto the fire road. 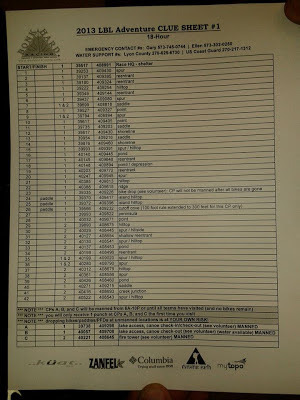 Although less severely than before, we are still behind our self-imposed schedule, so we decide to drop CP15 and CP40, two CPs that would have required a longer out-n-back run from the road to collect. We're all warmed up and we fly through this section. The boys tow me when the road is good. We even run into a few 8hr teams and exchange shouts and cheers. Once we return to the fire tower, we are surprised to find out that no other teams left their bikes there like we did. We frantically consider alternate route options for a few seconds and then have to dismiss the distraction and focus on the business of transition. Everyone's shoes are frozen and it takes extra time to cram our feet into them. The zippers on my shoe covers won't work either, so I am just going to have to cross my fingers that they don't get caught in my cranks. David, Doug and I finish transitioning just a few seconds before Jeff and are lured to the fire to warm our hands up. Approaching a warm fire in the middle of an adventure race is dangerous. Fires have magical abilities to lull racers into never leaving a TA. Jeff is aware of this and yells at us to get moving. We snap back to attention and depart the TA down a steep gravel hill. I chant IlovemybikeIlovemybikeIlovemybike because the windchill is really cold. 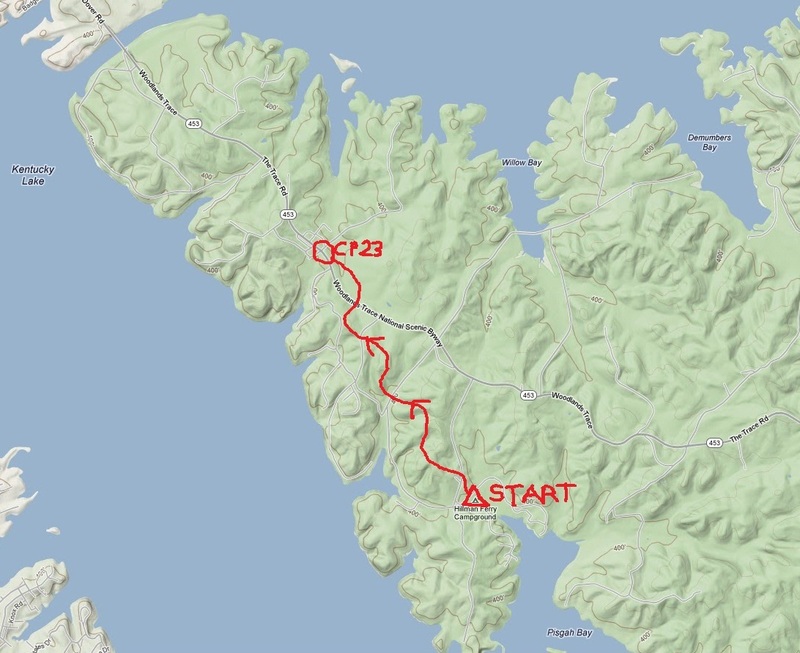 We have a short bikewhack, then cross the Trace, then set out to get CP30, the one that we dropped from Trek 3. It's a little tricky with some new singletrack being built in this area. On our way to CP30, we pass Bushwhacker riding the other direction and it scares us. What if they have a better plan? We hustle even more. David is fairly confident on our attack to CP30 and we strike off into the woods. He and Jeff thrash around for a good chunk of time without finding the CP. This is not a good sign. Finally Jeff takes a closer look at the map and sees that there are two similarly-placed gridlines. We might have used the wrong one when plotting the night before. 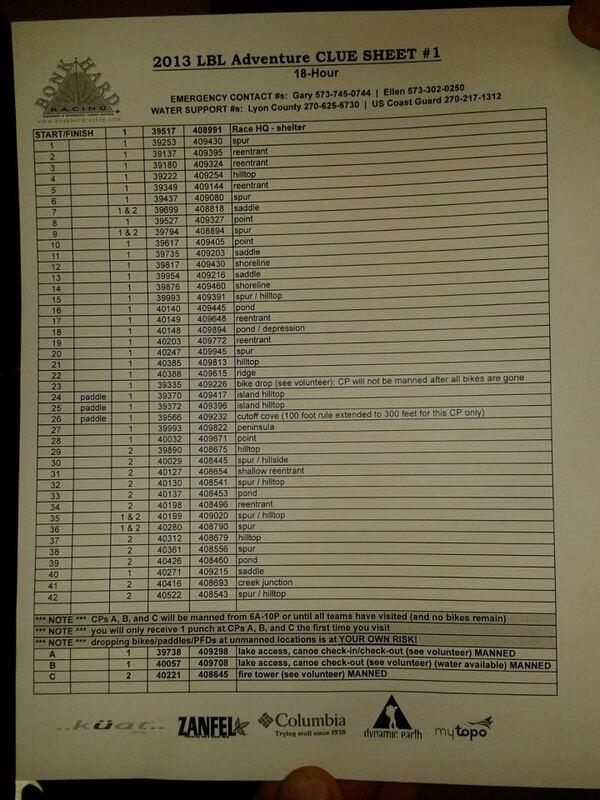 We check the cluesheet quickly and his suspicions are correct - CP30 is misplotted. Fortunately, the actual location is only a few hundred meters away so we are able to fix our mistake quickly and are back on the bikes, once again behind schedule to make the final 11:00pm cutoff. We blast down the singletrack and I start to get nervous. Racing against a team is one thing, but racing against the clock adds a whole 'nother level of stress. We pick up CP29 after a short out-n-back run. We stop at the attackpoint for CP7 with 42 minutes left on the clock. We know CP9 is impossible at this point, and we estimate we need 30 minutes to get from here to the finish line. So we give ourselves 12 minutes to hike up the reentrant, punch CP7, and get back on the bikes. Let's do this. We strike off into the woods, Jeff and David leading the way, until our headlamps ping the reflective tape of the control flag. Perfect! Jeff flies up to get the punch as we all start picking our way down the dark reentrant. We complete the out-n-back in 9 minutes. Now we have 33 minutes to bike the remaining few miles of singletrack back to Hillman Ferry Campground and the finish line. Those are some tense miles, I'm checking my watch every time the trail smooths out for more than a few feet. Pretty soon, we can see the campground lights filter through the woods. We use a short bikewhack to get onto the access road and start to hear Bonk Hard's signature cowbell greeting. It's such a relief and we cruise into the finish at 10:49pm! 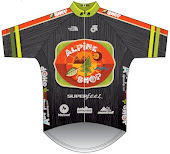 David, me, Doug, Jeff, and the new Alpine Shop jerseys! Carrie is at the finish line to greet us and we take lots of pictures in our new jerseys. I see a few other teams around but not as many as I expected. How did we do? I feel sort of funny asking but Carrie sees the question on my face and confirms that we won by a few CPs. Awesome! After the energy of finishing wears off, it's clear we are all very tired and very cold. I feel more sleepy than anything - racing 18hrs is hard enough, let alone doing it on 2 hours' sleep. So we all put on dry clothes and eat some of Bonk Hard's delicious post-race food. I have been dreaming about those bbq sandwiches and baked beans for the last few hours! There is a great fire going too so we catch up with other racers while staying warm. I really start to fade about midnight, but we stick around for the awards ceremony since there are awesome prizes to pick from. However, when we are called up to the prize table, my brain can't really make sense of anything so I pick a small red blinky light as my prize - completely passing over nice winter jackets, packs, watches, etc. That is race brain for you! A different team approaching CP B later in the day. Racing is beautiful. The LBL Challenge was a great race to kick off our season. It was a really unique format that allowed teams to push themselves as much as they wanted in the cold weather. We made a good plan, dealt with really horrible conditions at times, adjusted our plan as needed, kept our stomachs happy, and managed to finish on time. And we all still like each other. Win! Wow, I was sad not to be racing LBL this year, but that sounds kind of brutal. Awesome job! Congratulations to you and the team! Hi, Emily. Super Kate and Team Virtus shared your blog on Facebook, thanks to them I found your blogging site. Your report was a lot of fun for me to read. 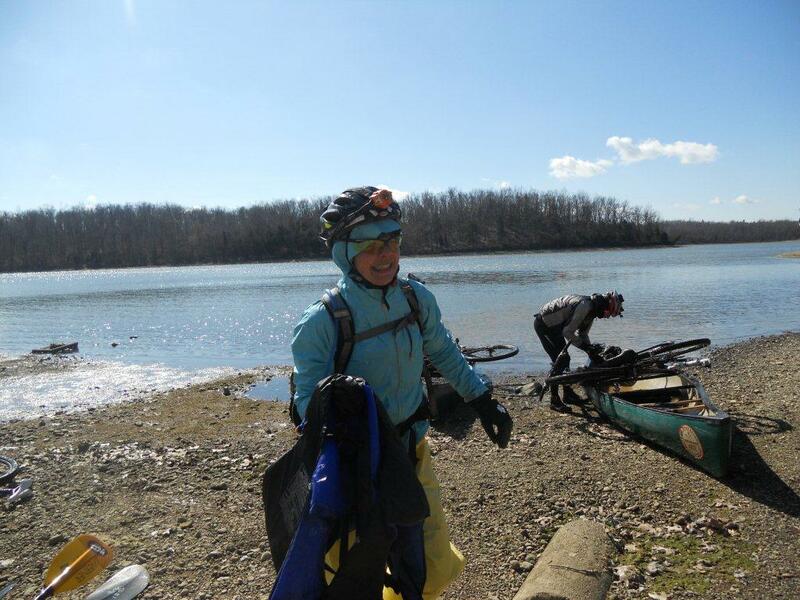 I didn't discover adventure racing until later in life (age 59, first race Inagural Truman Lake Race, Team Virtus so humorously wrote up), so many of my adventure races I experience vicariously through you and others that make them come to life online. Thanks for sharing! Awesome you race with Alpine Shop this year! At many races I have volunteered it is them and Bushwackers or WEDALI battling it out. Thanks again. HI Susy!!! Thanks for leaving a comment AND saying hi at the A-meet this weekend. Sorry we couldn't chat more! I feel like I know you though from Virtus's reports. Hope to run into you at a future event!